If you are a scripter like me and if you heavily use regular expression you may find this tool really useful. If you have used regular expression you may know how daunting it may be write the right expressions, but when you make the expression specific you would find it amazingly helpful for finding the right data, files or whatever else you need. Capuchin a four limbed 7 kg robot scales vertical walls using foor and hadholds like a human climber. This Robo carefully balances its weight across its arm and legs using force sensors in the tip of its limb. This robo can climb around 40 times faster than an earlier climbing robot built by the same team. Read more about Stanford robo climbs wall! Sub prime loans, ARM, Fore closure so many bad news about housing market. 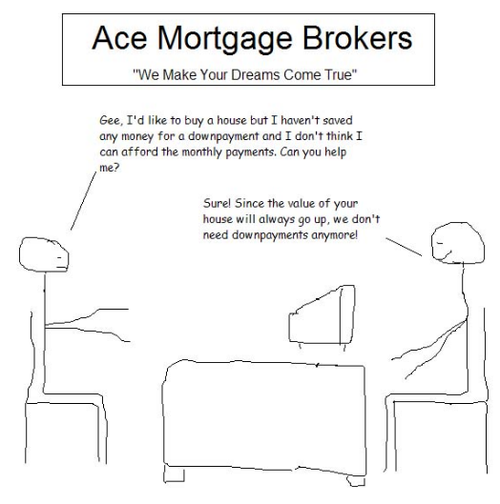 Barry Ritholtz has put together a funny nice slide show in Google docs that goes over the whole home market sub prime crisis. Flexible Keyboard Wash it! Bend it! Pack it! Read more about Flexible Keyboard Wash it! Bend it! Pack it! The Gale Group, a part of Cengage Learning has opened up it large and ever expanding vault of digital content to world, giving you direct and easy access to its resources. You can go AccessMyLibrary.com and browse its 30 million articles directly. If you have ever tried to login in to a Hotspot for your mobile device you would know how painful it is to connect. You got to open a browser and login in from our browser fiddling with the small keyboard . When it comes to managing your digital photos you have so many choices and they are so man web applications that enables you to upload your photos and share it with your friends and virtual pals. Nice plug-in for FireFox browser, very handy when you are searching for some thing and end up with bunch of tabs opened. This plug-in would keep track of relations of your open tabs to each other so you can follow the trail back. It groups the tab file a folder tree in explorer and new tabs opened from links are attached automatically to current tab.